Transcatheter aortic valve implantation (TAVI) is currently performed through an alternative access in 15 % of patients. The transapical access is progressively being abandoned as a result of its invasiveness and poor outcomes. Existing data does not allow TAVI operators to favour one access over another — between transcarotid, trans-subclavian and transaortic — because all have specific strengths and weaknesses. The percutaneous trans-subclavian access might become the main surgery-free alternative access, although further research is needed regarding its safety. Moreover, the difficult learning curve might compromise its adoption. The transcaval access is at an experimental stage and requires the development of dedicated cavo-aortic crossing techniques and closure devices. Thomas Modine is a consultant for Boston Scientific, Medtronic, Edwards Lifesciences, Cephea, MicroPort Scientific Corporation, GE Healthcare and Abbott; he received a research support grant from Edwards Lifesciences. Pavel Overtchouk has no conflict of interest to declare. The transfemoral (TF) access is favoured by international guidelines on TAVI because of its reported superiority to the transthoracic approach.1–3 In spite of the progress in miniaturisation of new-generation transcatheter heart valves (THV), comorbidities and unfavourable anatomy preclude TF access in 15–20 % of patients according to contemporary registries.4,5 Besides, vascular complications with the TF approach are as high as 6 % in recent randomised Placement of Aortic Transcatheter Valves 2 (PARTNER 2) and Surgical Replacement and Transcatheter Aortic Valve Implantation (SURTAVI) trials, which reflects that some patients could benefit from an alternative approach. 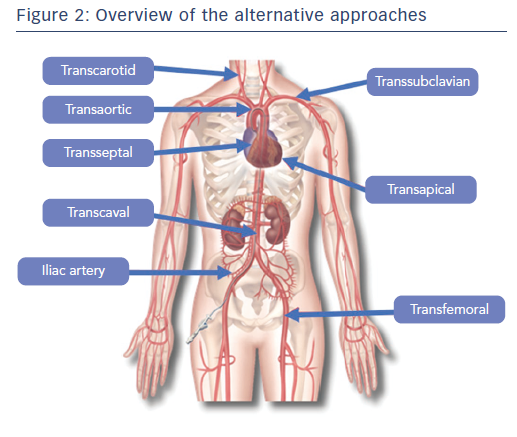 Historically, the transapical (TA) approach was the first to be introduced for broad clinical use in TAVI.6 Newer and less invasive pathways have since been proposed and developed, namely transcarotid (TC), transaortic (TAo), trans-subclavian (TS) and transcaval (TCv). However, the relative ‘invasiveness’ of one alternative approach compared with another is subject to debate. Invasiveness relates to the need for a surgical cutdown, general anaesthesia, vascular or heart lesion required for delivery system crossing, and potential impact on the other major systems such as the cerebral, respiratory and renal systems. No randomised trial directly compares the different approaches, and these alternative approaches are more or less subdued to a learning curve.7 Also, patient anatomy and comorbidities often determine eligibility for alternative pathways. Indeed, general anaesthesia for TA or TAo access may be contraindicated in patients with chronic respiratory insufficiency and the TS pathway may be precluded by vascular anatomy, such as tortuosity, stenosis or angulation. Patients who have previously undergone a coronary artery bypass may be unsuitable for the TAo pathway if they received venous grafts, or for the TS pathway if they received mammal artery grafts. 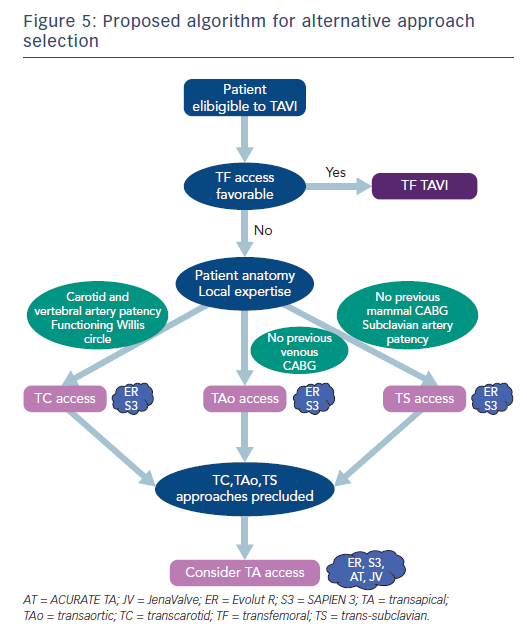 TA access is being progressively abandoned by TAVI operators because it requires a surgical cutdown, general anaesthesia and intubation. Also, there is growing evidence of inferiority to other pathways and open surgery in the elderly as well as lower-risk patients. TAo approach has often been presented as an alternative to TA when TF access is precluded.34 Observational data with high-risk patients suggest that TAo yields lower short-term as well as long-term mortality than the TA access.36–39 The risk of stroke is comparable to TF, but the invasive surgical access of the TAo approach yields high rates of life-threatening bleeding complications that are comparable to TA.37,39 In a recent observational study, Arai et al. provided a univariate comparison of 467 patients treated with TF to 289 patients treated with TAo and 42 patients treated with TA approaches. They found 30-day mortality to be 9 % for TAo versus 14 % for TA and 5 % for TF and one-year mortality of 20 % after TAo versus 30 % after TA and 13 % after TF. Strokes were fewer with TF and TAo (both 2 %) than TA (5 %). Acute kidney injury rates were lower after TAo compared with TA, but still higher than TF (13 % versus 31 % versus 5 %, respectively).37 Because no multivariable analysis was performed, these results should be considered with care. These results were consistent with those of McCarthy et al. who also found similar healthcare costs for TAo and TA approaches, although both were more costly than TF, which was partly a result of longer hospital stays.40 A more recent multicentre study reported further favourable outcomes after TAo TAVI with 6.1 % and 1.0 % mortality and stroke rates, respectively.41 Recent propensity-matched data in lower-risk patients are concordant.42 These results support the superiority of TAo over TA access, but not against TF. Indeed, major or life-threatening bleeding at 30 days has recently been reported to be as high as 66.7 % after TAo TAVI, twice as much as in a propensity-matched TF group.39 A meta-analysis by Amrane et al. found concordant 10.0 % 30-day mortality rate across 15 studies and 3.7 % strokes across nine studies.36 The patients included in studies of the TAo approach have mostly been of high surgical risk and further validation in lower-risk categories is warranted. TAo is also yet to be compared with non-TA alternative approaches in methodologically robust studies. The TC approach was first described in 2010.43 Experience with carotid access is important for the surgeon to provide optimal results with the TC approach because of specific anatomical challenges such as the presence of the vagus nerve and the respiratory tract. Theoretically, the left carotid access for TAVI should be favoured over the right because it provides superior coaxial alignment with the ascending aorta and optimal positioning for the THV during the device deployment. However, right carotid access has also been successfully used.44,45 Data from the recent FRANCE TAVI registry showed that up to 3.4 % of patients are now treated with the TC approach.5 The TC access has the potential to alleviate some of drawbacks of the other non-femoral approaches, given its minimally-invasive nature.35,46–48 Previous reports demonstrated the feasibility and safety of the TC approach, mostly with the Medtronic CoreValve THV.43,49,50 Our experience with the SAPIEN devices is also reassuring. The minimally-invasive surgery of the TC pathway has been mastered by numerous heart teams and recently it has been reported to have similar outcomes to TF access in terms of mortality and morbidity.49 Recent studies reported a mortality of 6.3 % at 30 days and 16.7 % at one year. Furthermore, rates of 30-day cerebrovascular events in our registry were similar to existing data with transfemoral TAVI,51 in particular the rate of 30-day stroke was under 2.5 % with TC TAVI.44,49,50 Preference for local anaesthesia with conscious sedation to general anaesthesia is team-dependent. Azmoun et al. observed in-hospital death in two of the 19 patients treated with TC TAVI under local anaesthesia in their cohort.50 One larger registry reported lower numerical rates of 30-day strokes with local anaesthesia and conscious sedation than general anaesthesia (0.0 % versus 2.2 %), albeit without statistical significance.44 Furthermore, the TC approach permits fast ambulation and short hospital stay (median four days) after the intervention.50 Our team has previously demonstrated the effectiveness and safety of the TC TAVI with the Medtronic CoreValve system44,49 and our practice has provided reassuring feedback with the Edwards SAPIEN system as well. The percutaneous approach is relatively recent. It has been reported to be feasible and safe in one German cohort of 100 high-risk patients, mostly through left axillary artery and under general anaesthesia. Thirty-day mortality was 6 % and 1-year mortality was 15 %; no stroke was reported.56 The percutaneous TS approach could potentially become a first-choice alternative pathway by avoiding surgical cutdown. However, manual compression is often ineffective for anatomical reasons, exposing patients to potentially fatal bleeding complications. As a result, some additional complex operative steps are required to avoid cataclysmic bleeding, with the insertion of a wire in the ipsilateral brachial artery externalised through the femoral artery or contralateral brachial artery for balloon occlusion or covered stent implantation in case of failure of the percutaneous closure system, such as the Prostar® (Abbott Vascular) or ProGlide (Abbott Vascular).56 Hence, achieving optimal results will require operators to confront a difficult learning curve. Also, further research is required to validate this approach in intermediate- and low-risk patients. The TCv approach remains an experimental approach, to be performed by expert centres as an option in patients who are ineligible for TF as well as the other alternative approaches, with abdominal anatomy compatible with a cavo-aortic crossing. The TCv access provides favourable operating room ergonomics and is compatible with conscious sedation. Nevertheless, if sufficient improvements of the technology dedicated to cavo-aortic crossing and closing are achieved, the TCv approach might gain popularity among TAVI operators in the future. In conclusion, the perfect alternative pathway should be performed percutaneously, under conscious sedation with local anaesthesia, and yield similar results to the arterial TF access regarding the major complications of perioperative mortality, stroke, and major bleeding. None of the existing approaches satisfy all these criteria (Figure 4). As TAVI indications expand to younger and lower-risk patients, perioperative mortality and stroke will become increasingly intolerable, which might encourage TAVI operators to select approaches with the lowest rates of such complications. Hence, when TF access is precluded, TC and TS approaches might benefit from this expansion of indications in the future. Besides these safety concerns, the choice of one alternative access over another is often a matter of anatomical feasibility as assessed by preoperative imaging and local expertise (Figure 5). Leon MB, Smith CR, Mack MJ, et al. Transcatheter or Surgical Aortic-Valve Replacement in Intermediate-Risk Patients. N Engl J Med 2016;374(17):1609–20. Nishimura RA, Otto CM, Bonow RO, et al. 2017 AHA/ACC Focused Update of the 2014 AHA/ACC Guideline for the Management of Patients With Valvular Heart Disease: A Report of the American College of Cardiology/American Heart Association Task Force on Clinical Practice Guidelines. J Am Coll Cardiol 2017;70(2):252–89. Baumgartner H, Falk V, Bax JJ, et al. 2017 ESC/EACTS Guidelines for the management of valvular heart disease. Eur Heart J 2017;38(36):2739–91. Grover FL, Vemulapalli S, Carroll JD, et al. 2016 Annual Report of The Society of Thoracic Surgeons/American College of Cardiology Transcatheter Valve Therapy Registry. J Am Coll Cardiol 2017;69(10):1215–30. Auffret V, Lefevre T, Van Belle E, et al. 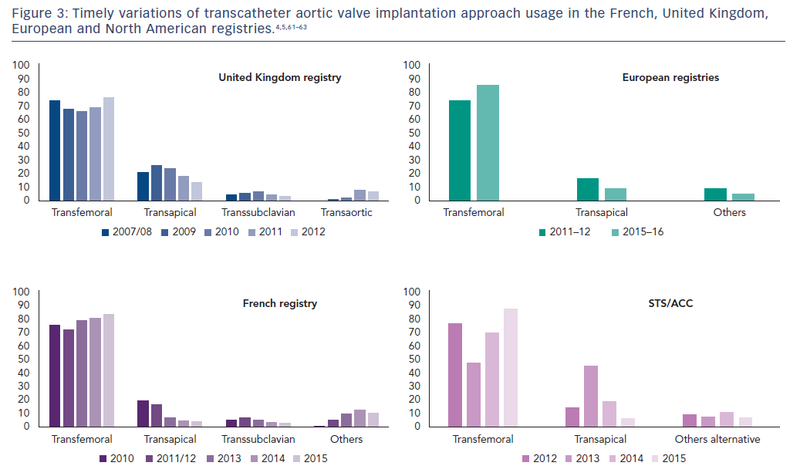 Temporal Trends in Transcatheter Aortic Valve Replacement in France: FRANCE 2 to FRANCE TAVI. J Am Coll Cardiol 2017;70(1):42–55. Walther T, Falk V, Borger MA, et al. Minimally invasive transapical beating heart aortic valve implantation — proof of concept. Eur J Cardiothorac Surg 2007;31(1):9–15. Henn MC, Percival T, Zajarias A, et al. Learning Alternative Access Approaches for Transcatheter Aortic Valve Replacement: Implications for New Transcatheter Aortic Valve Replacement Centers. Ann Thorac Surg 2017;103(5):1399–405. Walther T, Dewey T, Borger MA, et al. Transapical Aortic Valve Implantation: Step by Step. Ann Thorac Surg 2009;87(1):276–83. Nakatsuka D, Tabata M. Transapical approach for transcatheter aortic valve implantation. Ann Cardiothorac Surg 2017;6(5):553–4. Overtchouk P, Modine T. Transcatheter Aortic Valve Implantation (TAVI) Using the Transapical Approach. In: Advances in Treatments for Aortic Valve and Root Diseases [Internet]. Springer: Cham, 2018;331–47. Meyer CG, Frick M, Lotfi S, et al. Regional left ventricular function after transapical vs. transfemoral transcatheter aortic valve implantation analysed by cardiac magnetic resonance feature tracking. Eur Heart J - Cardiovasc Imaging 2014;15(10):1168–76. Gaede L, Kim W-K, Blumenstein J, et al. Temporal trends in transcatheter and surgical aortic valve replacement : An analysis of aortic valve replacements in Germany during 2012-2014. Herz 2016;42(3):316–24. Kodali S, Thourani VH, White J, et al. Early clinical and echocardiographic outcomes after SAPIEN 3 transcatheter aortic valve replacement in inoperable, high-risk and intermediate-risk patients with aortic stenosis. Eur Heart J 2016;37(28):2252–62. Thomas M, Schymik G, Walther T, et al. One-year outcomes of cohort 1 in the Edwards SAPIEN Aortic Bioprosthesis European Outcome (SOURCE) registry: the European registry of transcatheter aortic valve implantation using the Edwards SAPIEN valve. Circulation 2011;124(4):425–33. Yamamoto M, Mouillet G, Meguro K, et al. Clinical Results of Transcatheter Aortic Valve Implantation in Octogenarians and Nonagenarians: Insights From the FRANCE-2 Registry. Ann Thorac Surg 2014;97(1):29–36. Thourani VH, Jensen HA, Babaliaros V, et al. Outcomes in Nonagenarians Undergoing Transcatheter Aortic Valve Replacement in the PARTNER-I Trial. Ann Thorac Surg 2015;100(3):785–93. Biancari F, D’Errigo P, Rosato S, et al. Transcatheter aortic valve replacement in nonagenarians: early and intermediate outcome from the OBSERVANT study and meta-analysis of the literature. Heart Vessels 2017;32(2):157–65. Doshi R, Shah P, Meraj PM. In-hospital outcomes comparison of transfemoral vs transapical transcatheter aortic valve replacement in propensity-matched cohorts with severe aortic stenosis. Clin Cardiol 2018;41(3):326–32. Baumbach H, Ahad S, Rustenbach C, et al. Conventional versus Transapical Aortic Valve Replacement: Is It Time for Shift in Indications? Thorac Cardiovasc Surg 2017;65(3): 212–7. Mack MJ, Leon MB, Smith CR, et al. 5-year outcomes of transcatheter aortic valve replacement or surgical aortic valve replacement for high surgical risk patients with aortic stenosis (PARTNER 1): a randomised controlled trial. 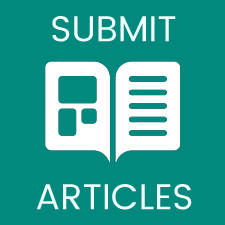 Lancet Lond Engl 2015;385(9986):2477–84. Rex CE, Heiberg J, Klaaborg KE, Hjortdal VE. Health-related quality-of-life after transapical transcatheter aortic valve implantation. Scand Cardiovasc J 2016;50(5-6):377–82. Nielsen HHM, Klaaborg KE, Nissen H, et al. A prospective, randomised trial of transapical transcatheter aortic valve implantation vs. surgical aortic valve replacement in operable elderly patients with aortic stenosis: the STACCATO trial. EuroIntervention J Eur Collab Work Group Interv Cardiol Eur Soc Cardiol 2012;8(3):383–9. Thyregod HGH, Steinbrüchel DA, Ihlemann N, et al. Transcatheter Versus Surgical Aortic Valve Replacement in Patients With Severe Aortic Valve Stenosis: 1-Year Results From the All-Comers NOTION Randomized Clinical Trial. J Am Coll Cardiol 2015;65(20):2184–94. Adams DH, Popma JJ, Reardon MJ, et al. Transcatheter Aortic-Valve Replacement with a Self-Expanding Prosthesis. N Engl J Med 2014;370(19):1790–8. Siontis GCM, Praz F, Pilgrim T, et al. Transcatheter aortic valve implantation vs. surgical aortic valve replacement for treatment of severe aortic stenosis: a meta-analysis of randomized trials. Eur Heart J. 2016;37(47):3503–12. Kempfert J, Holzhey D, Hofmann S, et al. First registry results from the newly approved ACURATE TATM TAVI system. Eur J Cardiothorac Surg 2015;48(1):137–41. Börgermann J, Holzhey DM, Thielmann M, et al. Transcatheter aortic valve implantation using the ACURATE TATM system: 1-year outcomes and comparison of 500 patients from the SAVI registries. Eur J Cardio-Thorac Surg Off J Eur Assoc Cardio-Thorac Surg 2017;51(5):936–42. Husser O, Kim W-K, Pellegrini C, et al. Multicenter Comparison of Novel Self-Expanding Versus Balloon- Expandable Transcatheter Heart Valves. JACC Cardiovasc Interv 2017;10(20):2078–87. Hamm K, Reents W, Zacher M, et al. Transcatheter aortic valve implantation using the ACURATE TA and ACURATE neo valves: a four-year single-centre experience. EuroIntervention J Eur Collab Work Group Interv Cardiol Eur Soc Cardiol 2017;13(1):53–9. Silaschi M, Treede H, Rastan AJ, et al. The JUPITER registry: 1-year results of transapical aortic valve implantation using a second-generation transcatheter heart valve in patients with aortic stenosis. Eur J Cardiothorac Surg 2016;50(5):874–81. Manoharan G, Walton AS, Brecker SJ, et al. Treatment of Symptomatic Severe Aortic Stenosis With a Novel Resheathable Supra-Annular Self-Expanding Transcatheter Aortic Valve System. JACC Cardiovasc Interv 2015;8(10): 1359–67. Holzhey D, Linke A, Treede H, et al. Intermediate follow-up results from the multicenter engager European pivotal trial. Ann Thorac Surg 2013;96(6):2095–100. Bagur R, Kiaii B, Teefy PJ, et al. First North American Experience With the Engager Self-Expanding Transcatheter Aortic Valve: Insights From the London Health Sciences Centre Heart Team. Ann Thorac Surg 2016;102(2):e167–71. Hayashida K, Romano M, Lefèvre T, et al. The transaortic approach for transcatheter aortic valve implantation: a valid alternative to the transapical access in patients with no peripheral vascular option. A single center experience. Eur J Cardio-Thorac Surg Off J Eur Assoc Cardio-Thorac Surg 2013;44(4):692–700. Bauernschmitt R, Schreiber C, Bleiziffer S, et al. Transcatheter aortic valve implantation through the ascending aorta: an alternative option for no-access patients. Heart Surg Forum 2009;12(1):E63-64. Amrane H, Porta F, Van Boven AV, et al. A meta-analysis on clinical outcomes after transaortic transcatheter aortic valve implantation by the Heart Team. EuroIntervention J Eur Collab Work Group Interv Cardiol Eur Soc Cardiol 2017;13(2):e168–76. Arai T, Romano M, Lefèvre T, et al. 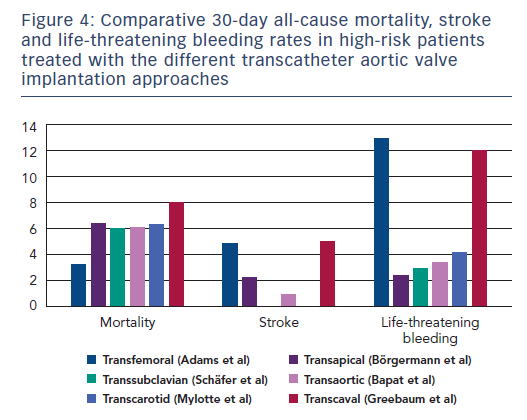 Direct Comparison of Feasibility and Safety of Transfemoral Versus Transaortic Versus Transapical Transcatheter Aortic Valve Replacement. JACC Cardiovasc Interv 2016;9(22):2320–5. Thourani VH, Jensen HA, Babaliaros V, et al. Transapical and Transaortic Transcatheter Aortic Valve Replacement in the United States. Ann Thorac Surg 2015;100(5):1718–26. O’Hair DP, Bajwa TK, Popma JJ, et al. Direct Aortic Access for Transcatheter Aortic Valve Replacement Using a Self-Expanding Device. Ann Thorac Surg 2018;105(2):484–90. McCarthy FH, Spragan DD, Savino D, et al. Outcomes, readmissions, and costs in transfemoral and alterative access transcatheter aortic valve replacement in the US Medicare population. J Thorac Cardiovasc Surg 2017;154(4):1224-1232.e1. Bapat V, Frank D, Cocchieri R, et al. Transcatheter Aortic Valve Replacement Using Transaortic Access: Experience From the Multicenter, Multinational, Prospective ROUTE Registry. JACC Cardiovasc Interv 2016;9(17):1815–22. Furukawa N, Kuss O, Emmel E, et al. Minimally invasive versus transapical versus transfemoral aortic valve implantation: A one-to-one-to-one propensity score-matched analysis. J Thorac Cardiovasc Surg 2018; S0022-5223(18)31243–1. Modine T, Lemesle G, Azzaoui R, Sudre A. Aortic valve implantation with the CoreValve ReValving System via left carotid artery access: first case report. J Thorac Cardiovasc Surg 2010;140(4):928–9. Debry N, Delhaye C, Azmoun A, et al. Transcarotid Transcatheter Aortic Valve Replacement: General or Local Anesthesia. JACC Cardiovasc Interv 2016;9(20):2113–20. Kallinikou Z, Berger A, Ruchat P, et al. Transcutaneous aortic valve implantation using the carotid artery access: Feasibility and clinical outcomes. Arch Cardiovasc Dis 2017;110(6–7):389–94. Greenbaum AB, Babaliaros VC, Chen MY, et al. Transcaval Access and Closure for Transcatheter Aortic Valve Replacement: A Prospective Investigation. J Am Coll Cardiol 2017;69(5):511–21. Ciuca C, Tarantini G, Latib A, et al. Trans-subclavian versus transapical access for transcatheter aortic valve implantation: A multicenter study. Catheter Cardiovasc Interv Off J Soc Card Angiogr Interv 2016;87(2):332–8. Blackstone EH, Suri RM, Rajeswaran J, et al. Propensity-matched comparisons of clinical outcomes after transapical or transfemoral transcatheter aortic valve replacement: a placement of aortic transcatheter valves (PARTNER)-I trial substudy. Circulation 2015;131(22):1989–2000. Mylotte D, Sudre A, Teiger E, et al. Transcarotid Transcatheter Aortic Valve Replacement: Feasibility and Safety. JACC Cardiovasc Interv 2016;9(5):472–80. Azmoun A, Amabile N, Ramadan R, et al. Transcatheter aortic valve implantation through carotid artery access under local anaesthesia. Eur J Cardio-Thorac Surg Off J Eur Assoc Cardio-Thorac Surg 2014;46(4):693–8. Nombela-Franco L, Webb JG, Jaegere PP de, et al. Timing, Predictive Factors, and Prognostic Value of Cerebrovascular Events in a Large Cohort of Patients Undergoing Transcatheter Aortic Valve ImplantationClinical Perspective. Circulation 2012;126(25):3041–53. Petronio AS, De Carlo M, Giannini C, et al. Subclavian TAVI: more than an alternative access route. EuroIntervention J Eur Collab Work Group Interv Cardiol Eur Soc Cardiol 2013;9 Suppl:S33–7. Bruschi G, Fratto P, De Marco F, et al. The trans-subclavian retrograde approach for transcatheter aortic valve replacement: single-center experience. J Thorac Cardiovasc Surg 2010;140(4):911–5, 915.e1-2. Watson DR, Yakubov SJ, Lyons JM, et al. Trans-subclavian approach for transcatheter aortic valve replacement. Ann Cardiothorac Surg 2017;6(5):565–7. Mathur M, Krishnan SK, Levin D, et al. A Step-by-Step Guide to Fully Percutaneous Transaxillary Transcatheter Aortic Valve Replacement. Struct Heart 2017;1(5–6):209–15. Schäfer U, Deuschl F, Schofer N, et al. Safety and efficacy of the percutaneous transaxillary access for transcatheter aortic valve implantation using various transcatheter heart valves in 100 consecutive patients. Int J Cardiol 2017;232:247–54. Kalra SS, Firoozi S, Yeh J, et al. Initial Experience of a Second- Generation Self-Expanding Transcatheter Aortic Valve: The UK &amp; Ireland Evolut R Implanters’ Registry. JACC Cardiovasc Interv 2017;10(3):276–82. Dahle TG, Castro NJ, Stegman BM, et al. Supraclavicular Subclavian access for Sapien Transcatheter aortic valve replacement- a novel approach. J Cardiothorac Surg 2018; 13:6. Petronio AS, De Carlo M, Bedogni F, et al. 2-year results of CoreValve implantation through the subclavian access: a propensity-matched comparison with the femoral access. J Am Coll Cardiol 2012;60(6):502–7. Greenbaum AB, O’Neill WW, Paone G, et al. Caval-aortic access to allow transcatheter aortic valve replacement in otherwise ineligible patients: initial human experience. J Am Coll Cardiol 2014;63(25 Pt A):2795–804. Ludman PF, Moat N, de Belder MA, et al. 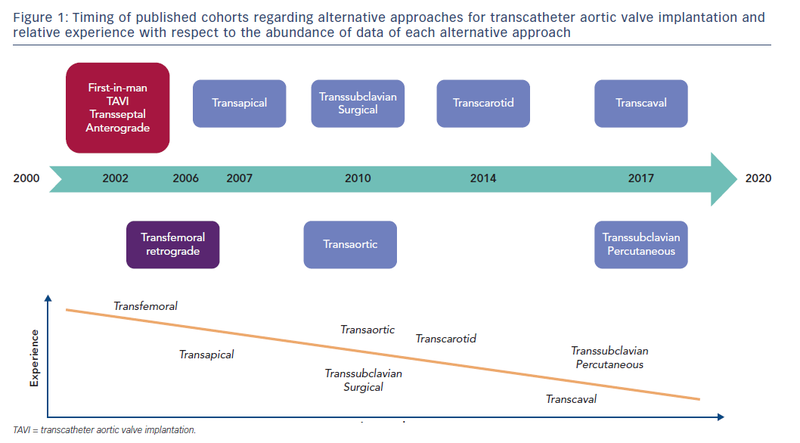 Transcatheter aortic valve implantation in the United Kingdom: temporal trends, predictors of outcome, and 6-year follow-up: a report from the UK Transcatheter Aortic Valve Implantation (TAVI) Registry, 2007 to 2012. Circulation 2015;131(13):1181–90. Petronio AS, Capranzano P, Barbato E, et al. Current status of transcatheter valve therapy in Europe: results from an EAPCI survey. EuroIntervention J Eur Collab Work Group Interv Cardiol Eur Soc Cardiol 2016;12(7):890–5. Di Mario C, Eltchaninoff H, Moat N, et al. The 2011-12 pilot European Sentinel Registry of Transcatheter Aortic Valve Implantation: in-hospital results in 4,571 patients. EuroIntervention J Eur Collab Work Group Interv Cardiol Eur Soc Cardiol 2013;8(12):1362–71.